Between dodgy satellite broadband and not having the time or energy to sit down and go through my awful spelling, it’s been a while since I updated my training log online. It should all be up there now and pretty much up to date. Just to fill any readers (possibly only my parents) in on how things have been going – I am still training away down here in Wexford. I picked up a shin injury a month ago which has knocked proper running on the head ever since. Lately, I have been doing occasional very slow, barely more than a walk treadmill sessions. With a warm room and the running board on a big incline I can simulate some sort of a workout; while ensuring very little impact on my shin. It’s making progress and I am hopeful I can start reintroducing easy road runs over the next couple of weeks. It’s been frustrating, especially as I was only just beginning to find my running form again after two years of an achilles problem. Still, there is plenty of time to get things right for July. Swim and cycle training has been proceeding along nicely -I think. But without a race it’s hard to know for sure. I was planning to do some early season races this year but have to push that back a few weeks now. My weight is down from 73Kg after Christmas to 68kg. I am sticking somewhat to a healthier eating philosophy, but portion size is my big weakness. There has been quite a few “family occasions” too where I have treated myself to a lot of crap. That’s OK, Ironman training and the lifestyle can’t be a chore or penance. But I really should narrow down my definition of what constitutes a special family occasion. Proclamation day in Luke’s school was nice, but did I need to have had those five buns? – I think not. On a far more positive note. I am delighted to have the support of Wheelworx again. I hope to race under the umbrella of the ASEA Wheelworx team this season. ASEA Wheelwork is one of the major teams on the domestic cycling scene, but also has a very select group of Ironman athletes racing for them. Names you might be familiar with are Owen Martin and Rob Cummins both multiple Kona qualifiers and Bryan McCrystal the fastest Irish Ironman ever – who will jump between the two sports like only Bryan can. Needless to say I was chuffed and very flattered to be asked to join the team and hopefully repay their confidence in me with some good performances. 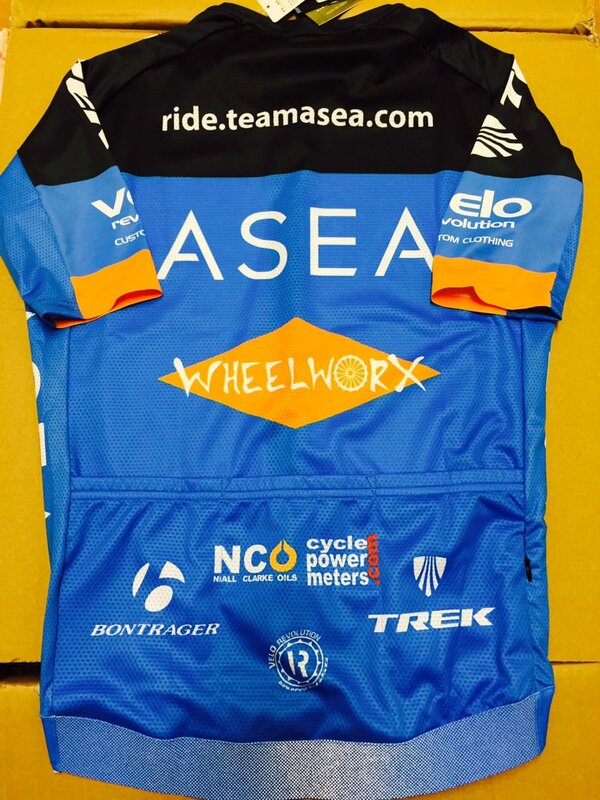 Being part of ASEA Wheelworx brings many advantages. There are nice gear benefits to be had; it should also be a great sounding board for advice and support. Some of the best training advice I have read recently has been put out there by Rob Cummins through his website www.tricoach.ie -worth checking out. There are even a few words up there from myself, but I am referring to Rob’s own take on all things Ironman. But most of all I am looking forward to having someone professional on hand to sort out the self inflicted mechanical disasters and panic I put my bike and myself through every time just before heading off to an important race. As part of this years Kona project I am trying to change a few things. I have made a few subtle changes in training. Some are necessary because of circumstances but others such as my swim technique, some of the turbo sessions and the little bit of strength work are intentional. As part of this I am looking at changing my bike setup. I would like to be more aero, and am willing to sacrifice a little comfort for this. It will be ongoing for a while and hopefully a new improved position will evolve. Recently I made a few tweaks. Luke and I have another video up with the first round of changes. Since making this I have had the bike on the road a couple of times. The lower front end is hard on my neck and shoulders but a lot of that is because I have been on the road bike all winter (that’s completely ceased up by sweat and can’t be adjusted into anything approximating a good position). I have raised the saddle on the TT bike a little since the road trials. I would like to try a narrower arm position but my tri bars won’t allow it. I have also had a long standing issue with the cleat position on one shoe – it has never felt right. Either I have two different length legs, or feet, or more likely there is a lot less flexibility in one foot following the achilles injury. I may look at having different cleat positions for each shoe or getting a lift put in one. Anyway check out the video and perhaps something obvious jumps out. Feel free to let me know. 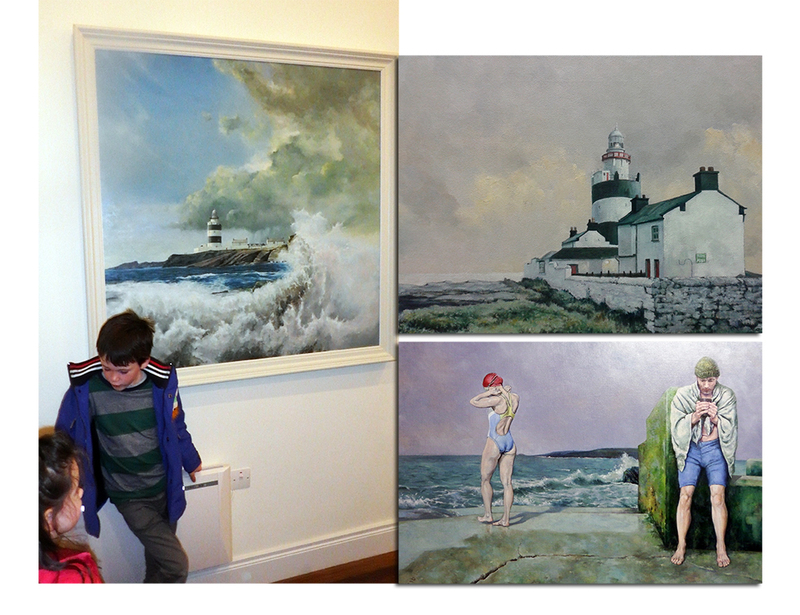 I have a painting The Swim, in an exhibition in Skerries (Ardgillian Castle) in April if anyone is up there for a run etc. If it sells, some proceeds are going to my old school in Skerries and some to my Kona sock drawer – here’s hoping. Next up I am thinking of doing a big triathlon related effort so no doubt I will post the result up here and will consider any serious offers! Luke and Emily say “Hi Nana & Grandad”. Keep up the great work Alan. While I am on. I have been enjoying a few swims lately in that pool the blew into your school. A great facility for your students to have access to and to my untrained eye the roof looks pretty secure these days. Fit looks good but having made this error for a brief 2 months I’d advise getting it checked. I recently did the same and felt grand, but now realise a couple niggles and tweaks have resulted from incorrect fit. I went too high on saddle and now lower back pain results. Had a prof fit since but the 2 months prior did the damage and still being physio’d out. Your saddle looks a tinge too high, but your stack looks too low as your drop from saddle to pads looks aggressive. Just a word of caution from someone recently regretting doing some home fit tweaks. It’s just not worth it if you’ve moved things by 20 mm or more then I’d stop. In saying the above, you do look comfortable so if can maintain and head/neck is free for tuck then perhaps works for you. I have taken the plunge and signed up for a professional fit. After ten years of this stuff its about time I think. You are right the front is very low. I thought I would try it out but it is proving hard on the shoulders and I suspect it will be returning to the usual hight soon. Thanks again for the feedback Ian. Much appreciated. I hope the physio has done the job and you are putting the final touches on your pre season training. Best of luck for the Summer ahead.